We started out on Saturday, Nov 1st. We waived goodbye to Asher and the Bryan family, then we were on the road. 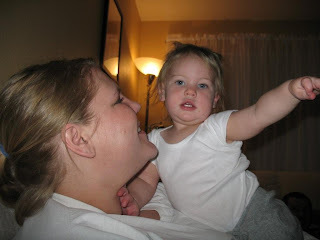 We drove to (great) Grandma Bryan's house in Erda, Utah and spent two nights there. While we were there, we got to enjoy a delicious meal with Grandma. Kelly drove from BYU and Katie happened to be in town too. We forgot to take pictures, though. 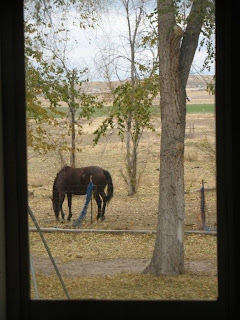 So all we have is a picture of the horse in back of grandma's house. On Monday, we drove to Annie and Joel's house in Wellington, Colorado (near Ft. Collins) and had so much fun playing with Taylor! She is so cute and fun to be around. She made us miss our little Asher. We had a nice dinner and Annie and I stayed up late laughing and telling stories. Sorry, Annie, this is the only picture we took! On Tuesday, we drove to Nauvoo, Illinois. 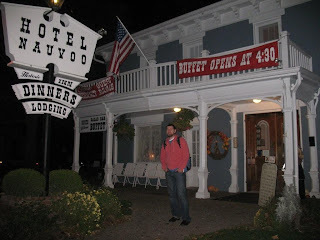 After a LONG detour through bumpy country roads in eastern Missouri (thanks to GPS directions), we finally got to our hotel sometime after midnight. We spent the next day touring Nauvoo. We saw the temple, the historic city, and the Smith family cemetery. Later in the day, we drove to Carthage, where we toured the jail where Joseph Smith was held and later killed. 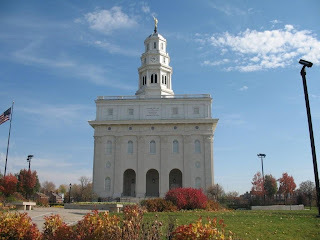 We spent most of Wednesday in Nauvoo and Carthage. Then we drove through Indianapolis and stopped at a Comfort Inn. On Thursday, we drove to Cincinnati, Ohio to see some of Matthew's mission. We drove around the downtown area, then decided to go to the Cincinnati Contemporary Arts Center (http://www.contemporaryartscenter.org/). After that, Matthew said I had to try some "Cincinnati chili" which is basically spaghetti with chili on top. It was pretty good. We left Cincinnati late in the afternoon and drove through eastern Kentucky so that I could see some of the areas where Matthew served his mission. I was surprised at how beautiful it was with the rolling hills and the gorgeous fall colors! We finally arrived at our new home in Silver Spring, Maryland at about 1am. We were exhausted, but very happy to be done driving!